Carlotta Grisi 's family was involved in opera. Although she had a beautiful voice she chose to dance and was enrolled in the famous La Scala Academy at the early age of seven. 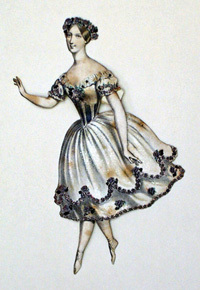 By the age of ten she was given roles, and in 1833, at the age of 14, she went on tour. While she was on tour in Naples she met Jules Perrot . He became her teacher--and a demanding one at that. She became Perrot's lover, and it was said that she married him, but there is no record of this union. Carlotta danced for awhile under the name Mme. Perrot. Through his contacts they worked in London, Vienna, Munich, and Milan, and, she sang and danced in "Le Zingaro" at the Theatre de la Renaissance in 1840. In 1841 she made her debut at the Paris Opera. Shortly after her arrival she created the title role "Giselle," a two-act ballet by Vernoy de Saint-Georges, Theophile Gautier, and Jean Coralli , with choreography by Jean Coralli and Jules Perrot . The part of Albrecht was danced by Lucien Petipa. Due to backstage intrigues Perrot was not given credit for his work in the ballet, so he left Grisi to carry on alone. She proved that she could do it on her own and continued to star in many successful ballets. She became a favorite at Her Majesty's Theatre in London, where her working relationship with Jules Perrot was as good as ever. In 1845 she appeared with Marie Taglioni, Fanny Cerrito , and Lucile Grahn in Perrot's "Pas de Quatre." Her last performance in the West was in "Les Metamorphoses." She joined Perrot in St. Petersburg, where he had been appointed ballet master. 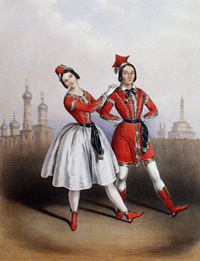 In 1854 she left Russia for Warsaw, where she intended to continue dancing, but she became pregnant by Prince Radziwell, who persuaded her to retire at the height of her fame. She settled near Geneva and spent 46 years in peaceful retirement. She kept in touch with her beloved Gautier and a few good friends. Grisi died a month before her eightieth birthday, unmourned, like many others, by the thousands who once adored her. con Jules Perrot en "La Polka"
en "Le diable a quatre"